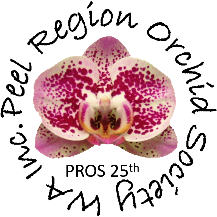 Peel Region Orchid Society is a not for profit organisation affiliated with the Australia Orchid Council and was founded on the 12th January, 1994 by a small group of orchid enthusiasts. The Society’s purpose is to meet and discuss orchids; to learn how to buy, grow and care for them; and to impart this knowledge to orchid lovers in the area. It is a friendly environment which welcomes orchid experts as well as first time novices who want to learn about growing orchids. As well as monthly meetings on the first Wednesday of the month we have workshops at people’s homes to learn about orchid growing, visits to commercial orchid growers sites and occasional social events. We also have an annual orchid show in September where members can display their orchids, compete for trophies and sell plants to other members and the public. To seek all fair remuneration, but accept no profit or success at the price of my own self respect lost because of unfair advantage taken or because of questionable acts on my part. To remember that in building up a collection it is not necessary to tear down another’s and to be loyal to my Society. Whenever a doubt arises as to the right or ethics of my position or action towards my fellow Society members, to resolve such doubt against myself. Always bear in mind my obligations to our society and abide by its Constitution and by-laws at all times. To be careful with my criticisms and liberal with my praise.